We are able to supply a range of signs suitable for various indoor applications. From basic vinyl stickers to solid metal, plastics and acrylics. So if you need a full colour sign, or just a single colour text, then we can use vinyl for a simple but effective signage. Vinyls can be applied directly to most surfaces, or we can supply a panel for the vinyls. 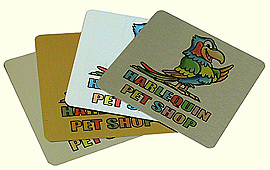 This is ideal to make signs more resistant as the vinyl on its own may not be sufficient for your requirements. For larger signs, we can print directly onto aluminium, plastic, acrylic, or even glass sheets using a special UV stable ink. Contact us with your requirements or pop in a see some of the examples we have.